The occasional “Meet the Roaster” Saturday Supplement series where the Coffee Spot visits various coffee roasters. A fishmonger sells fish. And an ironmonger sells iron. Therefore, a coffee monger sells coffee. Obviously. 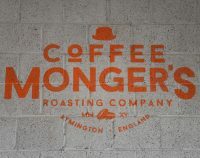 Hence the delightfully-named Coffee Monger’s Roasting Company from Lymington in Hampshire, which I first came across at the London Coffee Festival in 2016, where I came away with a bag of its Regina espresso blend. Fast forward 2½ years and, on my annual visit to the area, I was reminded of Coffee Monger’s by Jass at Lemana, who told me that people were welcome to pop by the roastery and have a cup of coffee. Which, naturally, I did. Coffee Monger’s is a little bit out of the way on an industrial estate just north of Lymington, the unit doubling as both roastery and retail outlet/coffee shop. In similar fashion, this post will double up both as a Coffee Spot in its own right and as a Meet the Roaster feature on Coffee Monger’s. Roasting six espresso blends and a number of single-origins, you can buy any of the coffee in retail bags, plus you can pop in for an espresso, Americano or flat white/cappuccino/latte, etc, from the Rocket Espresso machine, made with whichever blend is on at the time (decaf is also available). The subject of today’s Meet the Roaster has a long history. I visited the original Yorks Bakery Café on Newhall Street during my first trip to Birmingham exactly four years ago today, when I met a knowledgeable, engaging young barista called Richard. Since then Yorks has expanded, both in size and ambition. First came the new Yorks Espresso Bar at the Colmore Row end of the Great Western Arcade. Then, at the end of 2015, Newhall Street closed, the site undergoing a major redevelopment, with Yorks moving the Bakery Café to new premises on Stephenson Street, next to Birmingham New Street Station. Now there’s a third Yorks, with a new branch at the Ikon Gallery. 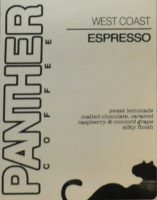 Long before I ever visited Florida/Miami (or, indeed, had plans to), one name in speciality coffee stood out: the subject of today’s Meet the Roaster, Panther Coffee. When I found myself on a business trip to Miami, with next-to-no-time to explore, it was the one place that I decided I had to visit. As luck would have it, our team dinner, on my last night in Miami, was at the Wynwood Kitchen & Bar, just two blocks north of Panther on NW 2nd Avenue. I took this as a sign, and, getting out of the meeting slightly early, I jumped in a cab and made a beeline for the Wynwood District. Panther was established five years ago and while it now has three branches, this one (Wynwood) is the original. As well as being a rather nice coffee shop (which now features as a Coffee Spot in its own right), Panther roasts all its coffee here, on a vintage, 1927 Perfekt roaster. However, change is afoot since the roaster is nearing capacity and Panther has plans to move to a new roasting facility, where it will install a 22kg version of the same machine. So, come down while you can if you want to watch the coffee being roasted in-store. The subject of today’s Meet the Roaster, Allpress Espresso, is at the opposite end of the scale from Weanie Beans, the roaster we met last week. Allpress can be said to be truly international, with roasteries in New Zealand (where it all started in 1986) Australia, Japan and the UK. It’s also pushing the (self-imposed) boundaries of what I started the Coffee Spot to write about. For me, speciality coffee is all about small-scale, independent operations. On the other hand, Allpress, despite its size, still very much has those qualities at its heart. 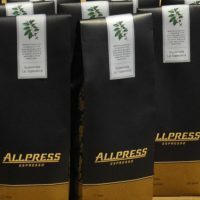 Allpress has been in the UK since September 2010, when the original roastery/coffee shop opened on Redchurch Street. Redchurch is still going, but only as an espresso bar, the roastery moving out to its new site in Dalston in May 2015 after four years of continued growth. The new roastery has plenty of room for expansion and includes a full café on site, with an upstairs that opens at the weekend for brunch. During the week, you’ll just have to “squeeze in” downstairs. The café is the subject of a Coffee Spot in its own right: today we are just looking at the roasting side of the operation. These days you can find Weanie Beans roasting coffee in its new north London home and, while the market stalls are gone, there is a new café, Heirloom, in the Buckinghamshire village of Edlesborough. 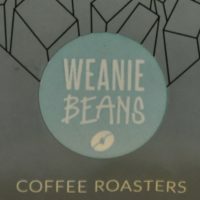 Although best known for its espresso blends, such as Citizen Kane, and its seasonal espresso blend, Weanie Beans is branching out. It roasts bespoke espresso blends for cafés such as &Feast (Barnes and Sheen) and is increasingly roasting single-origins for filter. Recently it’s launched a new espresso blend, Scout, which is proving a big hit in Heirloom. As well as finding Weanie Beans at a growing number of London coffee shops, you can buy all the coffee from the Weanie Beans web shop. There is also an increasingly popular monthly subscription service. I first came across The Roasting Party, subject of today’s Meet the Roaster, in 2014 at Beany Green, Paddington, where, for a couple of years, a Roasting Party flat white was the start to my working day. Shortly afterwards, I met Kirby and Wes, the Aussie duo behind The Roasting Party, at that year’s London Coffee Festival. I’ve been following their progress ever since, both as Beany Green has expanded and as The Roasting Party has gained accounts at the likes of C.U.P. in Reading, Brighton’s The Marwood and Espresso by K2 & Farm Girl Café in West London. Most recently, The Roasting Party has started supplying Winchester’s very own Coffee Lab. Liverpool’s 92 Degrees isn’t just an ordinary (speciality) coffee shop. Instead it also happens to be a roaster as well, and what’s more, it’s one that roasts on-site, akin to Manchester’s Ancoats Coffee Co. or Birmingham’s Quarter Horse Coffee Roasters. However, the uniqueness doesn’t stop there. Most roasters are usually set up by people with a strong background in coffee, whereas 92 Degrees is the brainchild of five friends from the software business, united by a love of coffee/coffee shops. What’s more, while most start small and grow with small steps, 92 Degrees went all in, roasting its own beans onsite from the outset. 92 Degrees, the coffee shop, has its own entry on the Coffee Spot. Today’s post, part of the occasional Meet the Roaster series, focuses on the roasting side of the business. 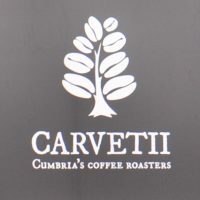 As well as supplying the coffee shop, 92 Degrees has a growing retail customer-base, plus you can buy the beans, either in the store or on-line. 92 Degrees roasts a mix of blends for espresso and single-origin coffees for both espresso and filter. 92 Degrees has also been a champion of good decaf from the outset, always having a single-origin decaf on espresso. I first came across Liverpool’s Neighbourhood Coffee, the subject of today’s Meet the Roaster feature, at last year’s Cup North. While Neighbourhood only started roasting in 2015, its founders, Ed and Chris, have plenty of coffee experience between them, having previously worked for green-bean importers and African coffee specialists, Schluter. 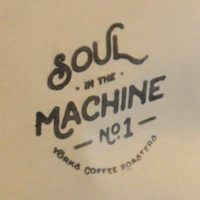 Spotting a gap in the Liverpool market, they set out to establish Liverpool’s first speciality coffee roastery. Working from a very modern set-up in a railway arch just north of the city centre, Neighbourhood roasts on a 15kg Giesen, a Dutch roaster which I see popping up more and more frequently in UK roasteries. 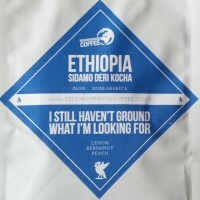 Neighbourhood roasts a couple of espresso blends and has four to six single-origins. You can now enjoy Neighbourhood’s coffee in select cafes in the Liverpool area, and, increasingly around the country, plus via the on-line shop. 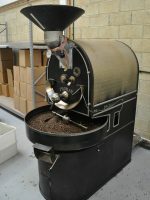 Like many small and start-up roasters, roasting is a small part of what Neighbourhood does. A large part of the business is building a market for speciality coffee, as well as providing training and support for existing and new customers. As much space in the arch is given over to the large training suite as it is to the roaster.